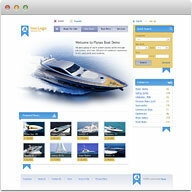 Your Own Boat & Yacht online classifieds business! Connect buyers with yachts' and ships' dealers! Boat classified script offers you not only a reliable business platform but also an opportunity to populate your site with ads imported from openmarine source. Add custom fields, forms, categories or new sections from the admin panel using advanced managers without having to make changes to the code. Along with the ability to switch between yacht/boat designed themes without losing data you also have flexibility in rearranging themes from the admin panel. The boats script comes with a list of pre-entered boat categories and subcategories, which you can always update with new makes and models. With the Google Maps integrated into the Software and enabled for every listing your sellers will be able to show location of their boats and yachts. Being able to search listings within a specific mileage based on a zip code will definitely contribute to better search experience and satisfaction. 03 Apr. General Nova - New Theme released! 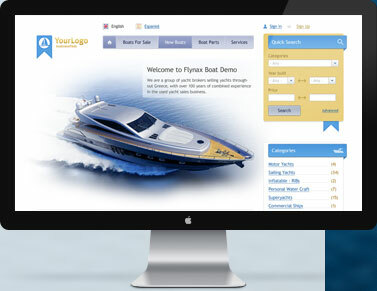 Boat script is PHP software developed on our own framework and designed for launching boat classifieds websites and directories. Flexibility in adding custom fields, forms, sections etc enables you to build your site from the admin panel targeting either a particular niche or the entire boat market. With the Boat script you also will get a few boat-oriented themes to choose from. How can I benefit from Boat? When you plan to start your own boat classifieds business it is essential that you get professionally developed software for building your classifieds website. Boat Script offers you all-in-one classifieds software, with a dozen of great features, plugins, applications along with seo-friendly and easy-to-use interfaces giving you the opportunity to launch a money making classifieds website.